Traffic and parking within the town-walls is admitted for few hours only per day. 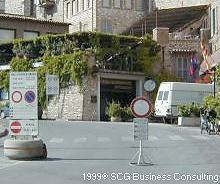 The access to the historical centre is nevertheless allowed for fetching from or deposit the luggage at the hotels. Parking in the historical centre during traffic opening hours is limited to one hour only. It is highly recommended to leave the car outside the town-walls, although there is one only fare-free parking site outside Porta S.Giacomo along Viale Albornoz. The parking site is linked with the centre by mini-buses. Still outside the town-centre lie the major fare-parking-sites such as Porta Nuova (linked to the centre by moving staircases) and the underground parking site of Piazza Matteotti from where you may easily walk to the centre.